An armchair profiler challenge based on the acknowledgments page in the debut story collection by Kris Bertin, a Haligonian bartender: We are presented with the fact that the stories were written when Bertin was between the ages of 23 and 30; his claim that the stories “might be the only things [he has] ever taken seriously in [his] life”; effusive thanks given to Alice Munro fan Alexander MacLeod and Wes Anderson–lauding cinephile Ryan Paterson; further nods to bar staff and customers for “supplying the raw materials with which to make” the stories. What’s fair to expect from the work itself? 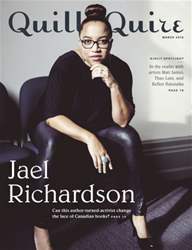 Jael Richardson: Can this author-turned-activist change the face of Canadian books?